The iconic Madagascar Lace Plant, Aponogeton madagascariensis. As the species name suggests, Aponogeton madagascariensis originates from the island of Madagascar, located off the eastern coast of Africa. 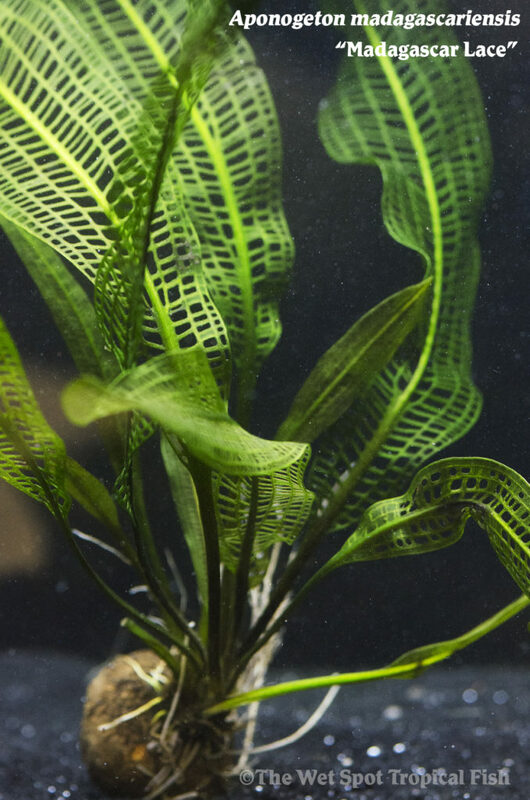 Commonly known as the Madagascar Lace Plant, the defining characteristic of is this species of Aponogeton is the lack of connective tissue that forms the surface of its leaves and lends the plant a somewhat delicate and ‘lacy’ appearance. Like most Aponogeton, Madagascar Lace Plants are easy to grow in the aquarium. The skeletal appearance of the leaves belies the toughness of this unusual plant. It requires medium lighting and is unfussy about water hardness, temperature or pH (although below 8 appears to be the general consensus). To ensure the health of this plant, it’s important that the foliage remain free from debris or algae that would otherwise impede photosynthesis and cause leaves to die. Characteristic of its genus, Madagascar Lace Plants have bulbs that store nutrients the plant can use to sustain itself through dry periods as well as a dormancy period during which the plant will lose its larger leaves, sprout smaller ones or become completely denuded. At this point, the plant should be left alone to regenerate itself naturally and does not require being completely removed from the aquarium to “rest” as other Aponogeton do. Under most tank conditions, A. madagascariensis remains a modest size plant that can be used in most aquariums. Adding CO2 fertilization and an enriched substrate produces much larger leaves and exponential growth that can easily overwhelm a 90-gallon tank. Once hailed as the “king of aquarium plants”, Madagascar Lace Plants are nonetheless an impressive addition to any hobbyist desiring an unusual and striking specimen to add to their collection.